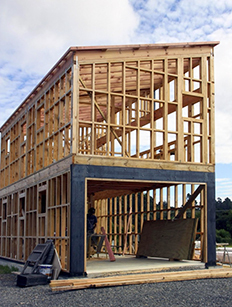 With Grand Designs coming to NZ to shoot an Aotearoa version of the “Build your own dream” plot line, a few friends and acquaintances have asked if the experience of building a home is really like Grand Designs, the TV show. We enjoy watching it ourselves… and of course the best telly is when things don’t necessarily go smoothly and when tempers flair onscreen. Being at home with the latest ‘post-moving-house-flu’ I guess I have had more time to reflect on this… Why did we start building in the first place? What is it we hope to achieve by building? Maybe it is timely to remind ourselves why we are doing this as we gird our loins for the final six-month push to get the house finished and get ourselves moved in (oh no, not another move… I can’t even contemplate that yet; it is too soon). Well, we were quite happy living in the little house in the orchard… We hadn’t been very brave with our design, but we were warm and snug and reasonably debt-free… but… we always had this dream of working with an architect and building something more contemporary that was better designed to meet our individual needs. Also, living on a lease-hold section on a community offered its own challenges and our family had changed too. Now we have a 5¾-year old and occasional visits from older children who are rapidly turning into adults and having their own lives/boyfriends/situations. 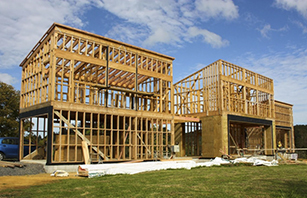 Building a new home on a free-hold section ticks many of these boxes and offers us more options to meet the future needs of the family, too.